Although many interpreted South Park’s season finale “You’re Getting Old” as a sign that Trey Parker and Matt Stone had grown exhausted with their creation and offered a surprise farewell, these viewers seemingly missed the fact—announced by Parker and Stone at the beginning of the season, and reiterated on their Daily Show interview following the Tonys—that they were still under contract to do the show through 2013. 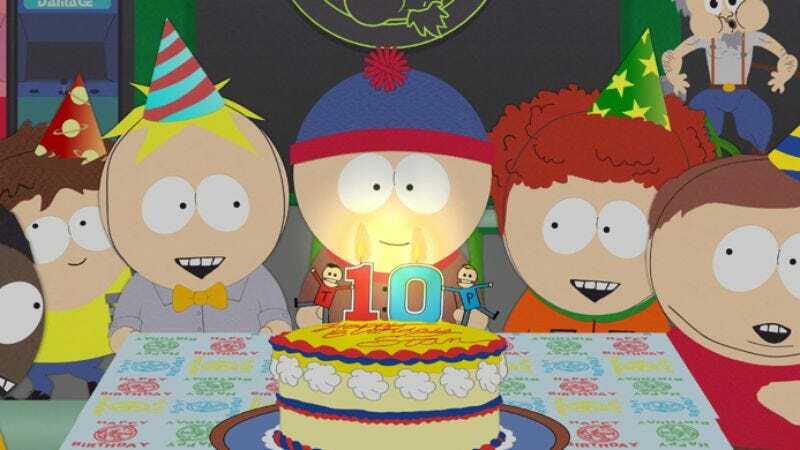 But allow Comedy Central (via EW) to put any lingering fears to rest: After the next seven episodes in South Park’s fifteenth season premiere on October 5, the show is still signed up to continue through 2013, taking them through at least two more seasons. Of course, there’s always the possibility that Parker and Stone will renege on that contract and, say, disappear to Africa. But there’s also the possibility that the Earth will be consumed by giant undersea sponges, launching the terrible Age of the Sponge, thus making the primetime lineup a moot point. At this moment let’s just deal in facts.